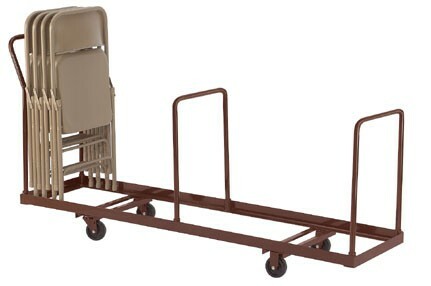 DY35 Storage Dolly - 35 Chair Capacity from National Public Seating Corp.
DY35 Storage Dolly from National Public Seating Corp. The solid construction provides a stable caddy for storing and transporting folding chairs in upright position. Built for easy handling with 4 castors: 2 swivel and 2 stationary (DY50 has extra middle castor for support); 3 tubular handles - one at each end and one in the middle provide excellent control when going around corners. Constructed of powder coated steel; color brown. Made in the USA. Note: Inner width is 19" with a 2" lip so chairs 15 1/4" - 19" wide can fit.